Looking for some easy DIY wedding ideas? We’re here for you! 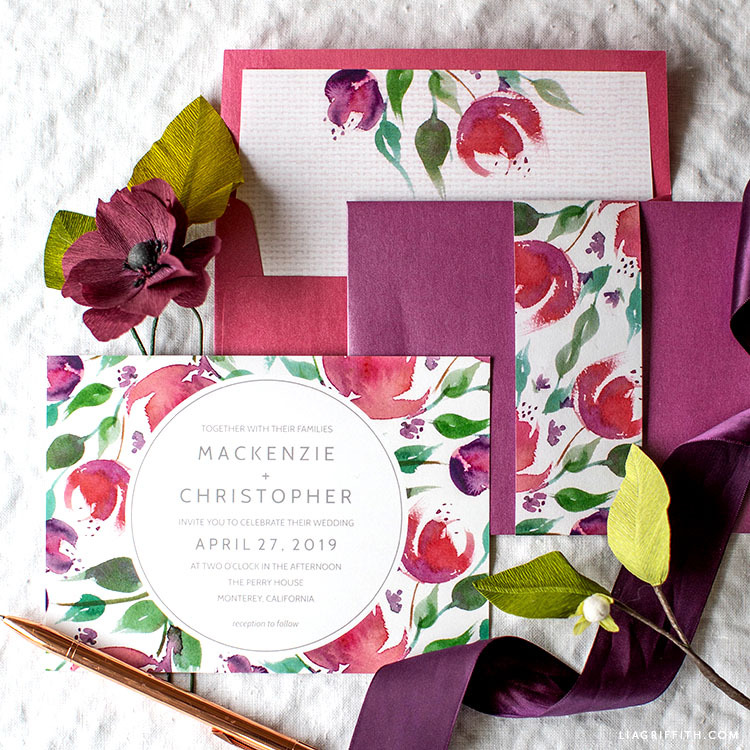 To help you save some money on your wedding, we have designed these watercolor floral wedding invitations for you to print at home. 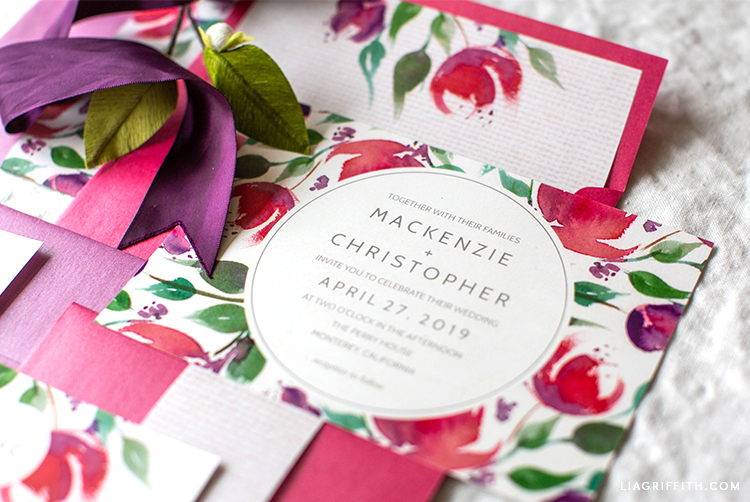 We created these printable invitations for a spring wedding, but they are versatile enough for a summer, fall, or winter wedding, too! If you want to see some other ideas, you can take a look at all of our paper wedding goods that we have on the site. 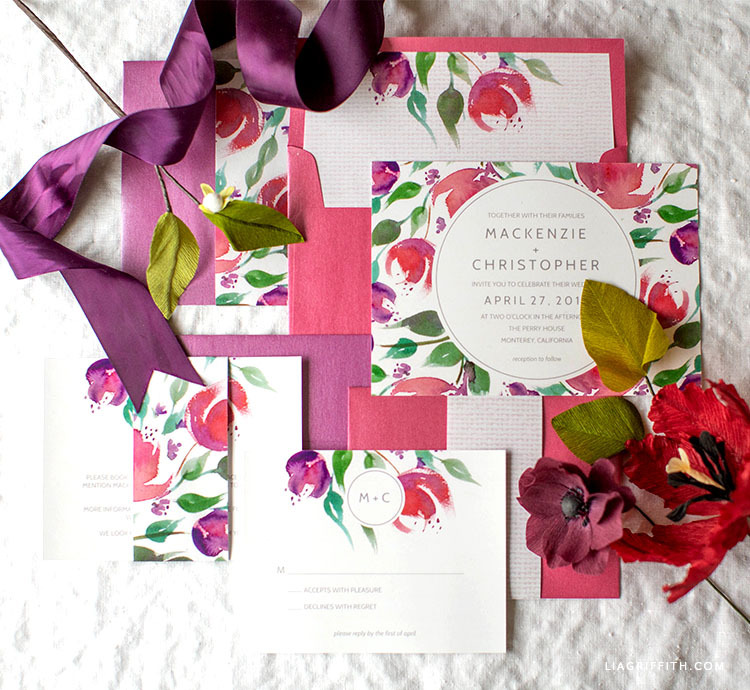 Both watercolor wedding invitations and floral wedding invitations are a popular choice. So I combined both of these concepts into one beautiful invite. As you may know, I have been drawing and painting more because of my online art class, so I painted this floral artwork for all of my flower lovers! If you are a member of our craft community, you can download the full wedding invitation suite below. This suite includes our editable floral wedding invitations, an RSVP card, the band/liner, and the envelope liner. We have also linked all of the tools and materials you’ll need to assemble your wedding invitations. Once you have downloaded and printed what you need, you can use scissors or a paper trimmer to cut your paper goods. If you want to save some time, we recommend using a paper trimmer to cut more sheets at once. Have questions? Just let us know! We love to help our brides and grooms get ready for their big day! Download the free font Cabin to edit the invitation and enclosures. Print the invitation and enclosure cards on white cardstock; print the envelope liner and belly band paper on text weight paper. Use scissors or a paper trimmer to cut each piece along the gray lines. The invitation will be 5″ x 7″ and the enclosure cards will be 5.5″ x 4.25″. The envelope liner will fit inside a straight flap A7 envelope. Trim the belly bands to fit the enclosure cards (ours are 2″ wide). We’re here to help you plan a memorable DIY wedding! For more ideas, check out our wedding DIY decor, thoughtful wedding favors, fun ideas for your wedding party, and last, but not least, wedding flowers! Thank you! This is beautiful and unique! I’m so glad you like it, Helen!